A special blend of Dark Chocolate with Rum'n'Raisins. Contains Dark Chocolate (82%), Raisins (17%), Rum (1%). Dark Chocolate contains Cocoa Solids 17%. Dark Chocolate 82%, Raisins 17%, Rum 1%. Chocolate heaven ! ! ! Thank you SANZA !. Like all good things, this amazing chocolate is no longer sold in the UK, I remember this from years ago, great to see it available again via SANZA. My favourite chocolate, its awesome, happy days! This is the best rum and raisin chocolate it's my husbands favourite . This was my Dad's favorite, it is also my Husbands, my Mum's and my Brother In Laws favorite, no longer available in the UK so its good to be able to get it and hide it and surprise all 3 of them now and again. This is great chocolate no longer available in uk . It's my husbands favourite so I send for it. This is a deliciously moist and unctuous bar. 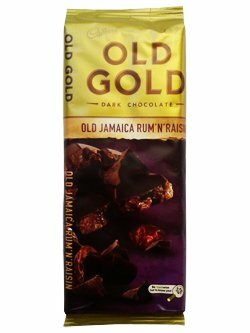 Packed full of scummy raisins, laced with old Jamaican rum and set in dark chocolate. Yummy!